Cyrtomium is a genus of about 20 species of fern majorly from temperature climates of eastern Asia, and parts of Africa and Madagascar. 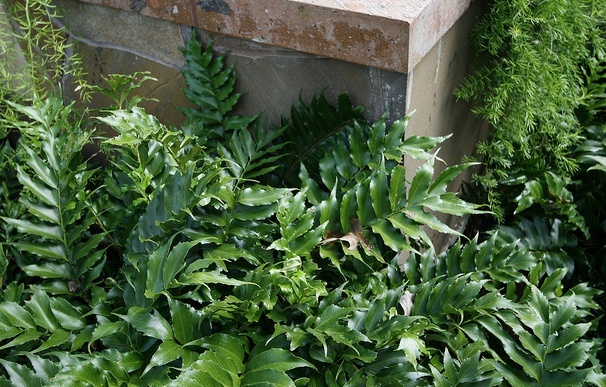 The most popular of these easy –to-grow ferns is Cyrtomium Falcatum which is commonly known as Holly Fern. Holly Fern is an evergreen perennial fern which is suitable for both outdoor and indoor plantation. The plant bears glossy green and erect fronds with edgy margins. The plant is quite hardy and survives a bit neglect. Whether grown indoor or outdoor, Holly Fern can grow in shady or poorly-lit areas (though bright sunlight is preferred) as far as it is protected from freezing temperature. Being a native of temperate climates, Holly Fern requires regular watering, a well-drained soil and temperature range of 50 to 72 F. Propagation is done from spores that germinate in a moist soil. In its habitat, Holly Fern grows in woodlands, crevices and rocks, hence it is can be grown successfully in landscapes and gardens in similar conditions as a nice ornamental and foliage plant.